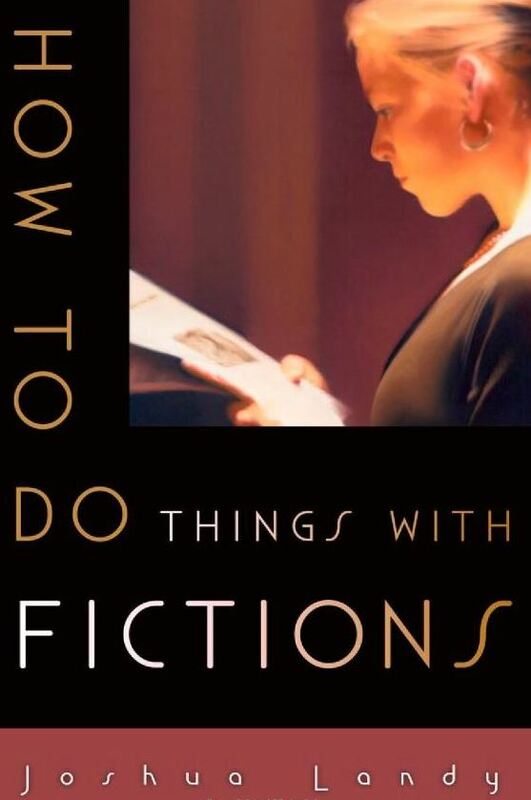 Joshua Landy’s article “Formative Fictions: Imaginative Literature and the Training of the Capacities” (2012) is an extended excerpt from Landy’s book How to Do Things with Fictions, which came out in late 2012. 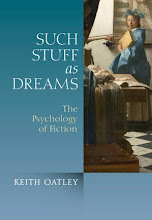 Landy outlines three main branches of theories of why we read fiction, or to put it another way and leaving intention out of the enterprise, what exactly we get from reading fiction. 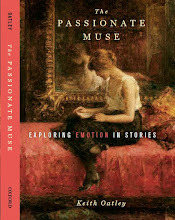 We read because we want to emulate or strictly avoid emulating a character or templates of form that might end up influencing the structure we weave through our own lives, (“exemplary” fictions), or because fiction-reading increases our emotions (such as empathy, other emotions) or decreases them (allowing us to gain control of our excessive emotions), or because we acquire knowledge about the world, cultural mores, another individual, or ourselves. Landy’s own theory he calls the “formative,” and he is swift to say that it pertains to a narrow range of works, each presenting a “salient formal device (authorial irony, Romantic irony, shifting point of view, intricate hypotaxis,...)” and that “bolsters in each case a corresponding capability: emotional control, social awareness, logical reasoning, hypothesis-generation, conscious self-deception, Zen-like detachment, even religious faith” (p. 184). And further, “For each capacity there is a specific formal device that corresponds to it and a finite set of texts that serve as uniquely propitious training grounds” (p. 196). His view, he notes, has much in common with Iser, and with other reader-response theories of the reader’s performative role. 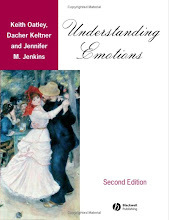 He differentiates his view from these asserting that, for him, readers don’t haphazardly happen to perform according to the affordances of the text, thereby acquiring some nugget of insight through their own cognitive or emotional sweat. Instead, certain fictional works, and only certain ones, render the reader normatively bound to perform in certain ways (p. 176, note 22) that exercise “capacities” but do not teach something new – Landy is adamantly opposed to the “message-based” (p. 180) views of fiction-reading. But as one advances in the paper, it becomes clear that the texts (even the very narrow group that Landy targets as essentially “formative”: the New Testament gospel author Mark, Plato, Flaubert, Mallarmé, Proust, Beckett, Brecht), if indeed we were to grant his claim that they are doing “formative” and not “informative” work, are not doing this work in the absence of other factors that it seems must be present for the “formative fictions” to be enabled. First, Landy uses many synonyms for the concept of getting better at a skill, such as “hone” (p.184, inter alia), “burnish” (p. 197, inter alia), and “fine-tuning” (p. 198), and consistently avoids describing the cognitive change in capacities as learning or knowledge-acquisition. It is, rather, “movement up the ladder of expertise” (p. 189). Indeed, the change in capacity is so unlike learning that the very skill that the honing and burnishing is purported to develop must actually already be in evidence: “In the formative circle [as opposed to the hermeneutic circle] what is both required for and burnished by the reading experience is not understanding but technique” (p. 197, my emphasis). Likewise in his reading of Mark, the prior knowledge of the disciples of Jesus before hearing the parables “both permits access to and is further strengthened by the parables” (p. 188, my emphasis). So, one must already have a little bit of the skill that the particular text is “bound” to “hone” for the honing to work. 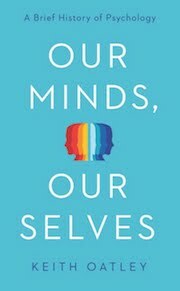 He claims, “We must already be a little bit good at doing the thing in question: a little bit good at following trains of logic, a little bit good at handling figurative discourse, a little bit good at standing back from our attitudes, a little bit good at juxtaposing claim with counterclaim” (p. 198). Someone or something else has already gotten the reader over the no-knowledge to some-knowledge threshold, whether the reader’s intention to possess better skills (not to “know” more, presumably)– Landy’s “formative fictions” just do the burnishing. Further, rereading seems to be as essential to the training process as repetitions of mechanics learned to date in any sport. But any coach will tell you that repetitions in the absence of targeted error correction are a waste of time. And error correction is not discussed here. If the only mechanism proposed for improving on the initial reading of a text is reading it again, then the reader’s progress is limited in the way in which the empiricist’s learner is limited: knowledge is acquired through sensory experience, and then more sensory experience, and so on, instead of through proposing conjectures and making one’s best efforts, or encouraging others to make their best efforts, to criticize those conjectures. If knowledge is radically different from trained skill, as Landy claims, then perhaps this should be expressed thus: the reader trains herself precisely to read as she always has. This lack might not be adumbrated so forcefully around Landy’s reading of Plato in which the reader’s capacities are honed when she is required to “mend the faulty arguments” (p. 202) which Plato has woven through his dialogues, or in Mallarmé, “where the training consists in the parallel processing of multiple referential dimensions” (p. 202), simply because these kinds of hypotheses about what the reader is required to do in reading these authors have been converging around the works at least since reader-response theory re-oriented our perspectives on fiction-reading. Convergence of hypothesized reading processes over time is not proof that any undergirding theory represents reality, of course, but does argue for its continued testing. However, when we are told, in by far the most lengthy example offered as support for his thesis, that the parables of Jesus, in both the contexts of first-century disciples and twenty-first century readers, “[f]ar from being designed to communicate information more effectively... serve, instead to make us better at handling and producing figurative language” (p. 189) and that the proper reception and production of figurative language is “what turns a novice into a true Son of God” (p. 190), one wonders if any skill honed, burnished, or fine-tuned could be worth the price of possibly getting it wrong in the context of no error correction mechanisms. Of course, one could argue that rereading is an error-correction mechanism, but that is perhaps only likely to be true for readers whose job it is to spend hours rereading texts and perhaps increasing their chances of winnowing out their own interpretive errors, for committed Popperians, or for psychologists who are aware of how captivating and resistant to change one’s own hypothesis can be. Thus, it seems that the narrow range of texts that offer “formative fictions” is to be read by a correspondingly narrow range of readers. Landy, J. (2012). Formative fictions: Imaginative literature and the training of the capacities. Poetics Today, 33, 169-216. Landy, J. (2012). How to do things with fiction. New York: Oxford University Press. More importantly, I don’t see any real reason to worry that the texts are failing to help their readers fine-tune their capacities. For one thing, there’s an aspect of training that does not require error-correction—the kind of thing that’s honed by the playing of scales, for example. And when it comes to the aspect that does require error-correction, formative fictions do in fact offer it, in exactly the way this post suggests. By tempting us into erroneous interpretations and then revealing them to be insufficient, they strongly encourage us to backtrack and amend. (Rereading of sentences, paragraphs, and even whole texts is not a rare phenomenon restricted only to professional readers and “committed Popperians,” as the post suggests; it’s actually quite widespread.) Thus readers frequently do end up “proposing conjectures and making [their] best efforts… to criticize those conjectures”; I’m not sure why the post seems to suggest I think otherwise. In short, yes, there are indeed other factors at work—a very important point—but those factors are very much in play. More thoughts on all this here.